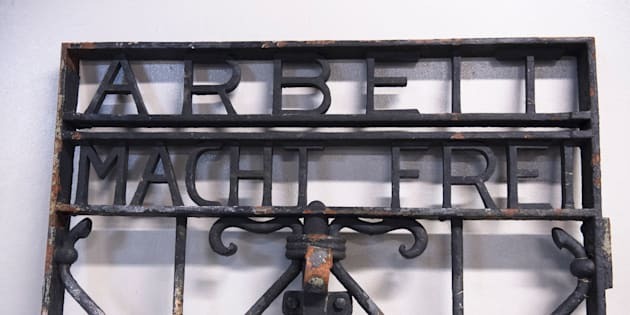 An anonymous tip this week led police in southwestern Norway to recover part of a historic gate that was stolen from a former Nazi death camp more than two years ago. The iron black gate, which bears the grim inscription “Arbeit macht frei” (”Work will set you free”), once stood at the prisoner entranceway of Dachau concentration camp near Munich, Germany. As evident from the gate’s text, Nazi propaganda sometimes depicted concentration camps as places of work and education for Jews and criminals, rather than torture-filled prisons where brutal human rights abuses occurred regularly. Dachau, the first concentration camp in Nazi Germany, opened in 1933, just after Adolf Hitler assumed power. Over the 12 years it operated, it housed over 188,000 prisoners and was the site of forced labor, inhumane medical experiments, at least 31,000 deaths and mass corpse cremations. U.S. forces liberated the camp in 1945, but Germany eventually opened it to the public for observation, as it remains to this day. After the 220-pound gate was stolen from under guard watch in 2014, German Chancellor Angela Merkel called the unresolved theft “appalling.” A replica gate was installed in 2015. The original gate will promptly be returned to the Dachau memorial following a judicial review, according to an official statement posted online.